Your choice of kitchen door handles can have the greatest impact on the overall look of your new kitchen but this is often a crucial detail that is overlooked and then becomes a last minute choice. Let me take you through some ideas and show you how much a difference the type of kitchen door handles can have on the final look. Although you see many kitchens without door handles at all, you may still prefer the practicality of a handle on your kitchen drawers. Often the style of your kitchen will not lend itself to a shark nose profile – that is the top of each drawer being inset so that you can open without handles. If this is the case then select a handle that disappears into the kitchen joinery. Very easy to do if you have dark cabinetry but achievable to a certain degree with white also. The kitchen below has white and silver knobs, even for the drawers and this disguises them. You can clearly see them but they don’t make an over-riding statement. 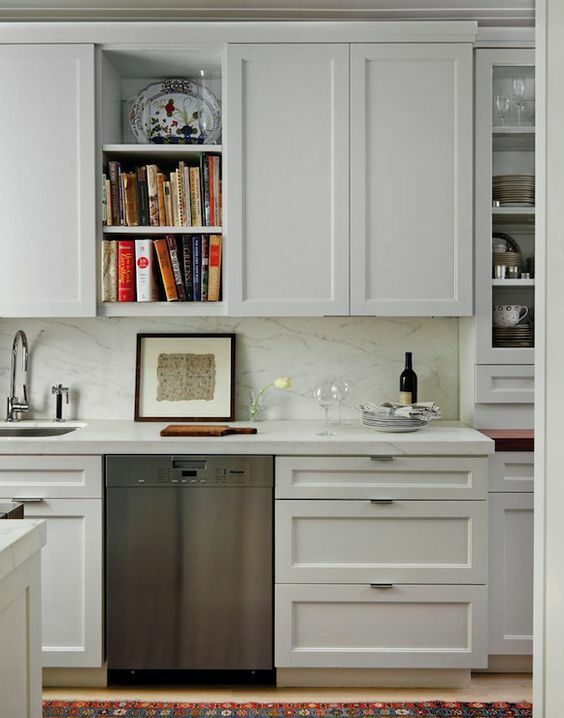 Another way to keep the look simple and understated is to use a hidden cabinet door handle. These are fixed to the underside of the cupboard door or the top of a drawer so that only a small portion is visible. I really like the look for the cabinetry below. Statement kitchen door handles look great and really define the look for your kitchen. You have to ensure you love them though as they become quite a feature. Ensure that rather than just selecting something that you love, that it links into the rest of of your scheme. 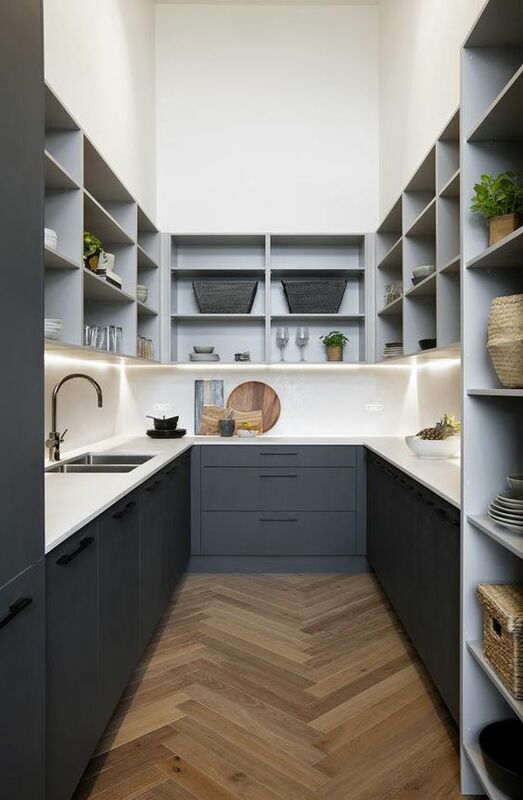 I really like this kitchen below from Tom House in the UK. He has brought a very masculine vibe to this kitchen design and has linked the strong dark colour statement of the kitchen handles to the other styling elements of the room. Without introducing other brass and darker elements in the room, the door handles could have looked a little out of place but by doing this the end result is very appealing. You can link the kitchen door handles to your kitchen styling in a more understated fashion as in the image below. The pale gold delicate door handles used here match the pale timber shelving and styling accessories. 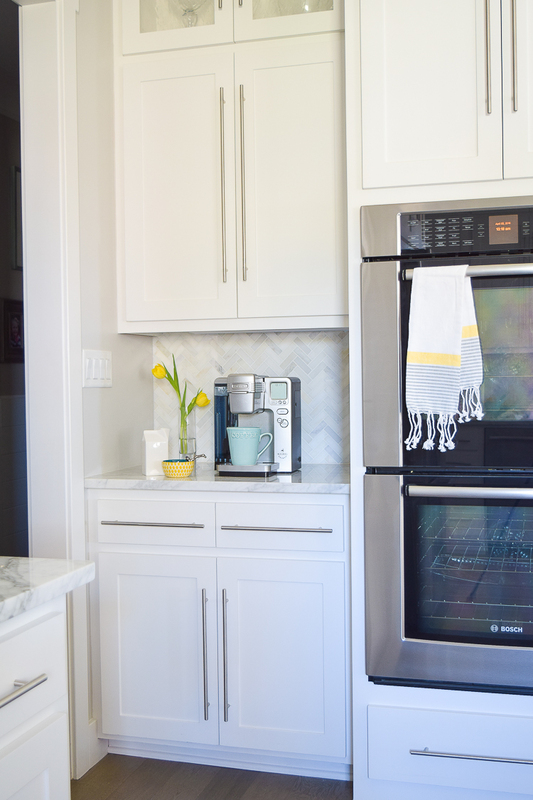 It is so important to get these details right so you must always look at the whole picture when designing a kitchen space. This is where a mood board can stand you in good stead. 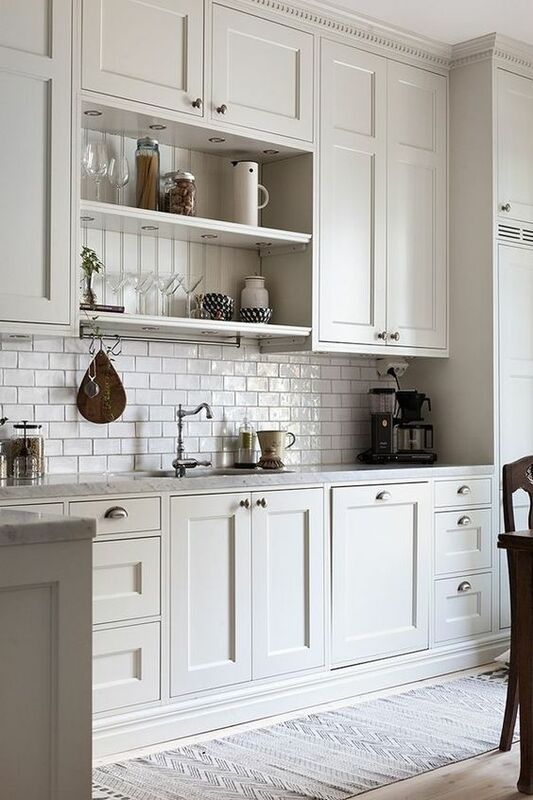 You would instantly see that the effect was wrong if you were planning to use darker door handles or a silver kitchen handle with the golden hues of the accessories and the honey tones of the shelf. 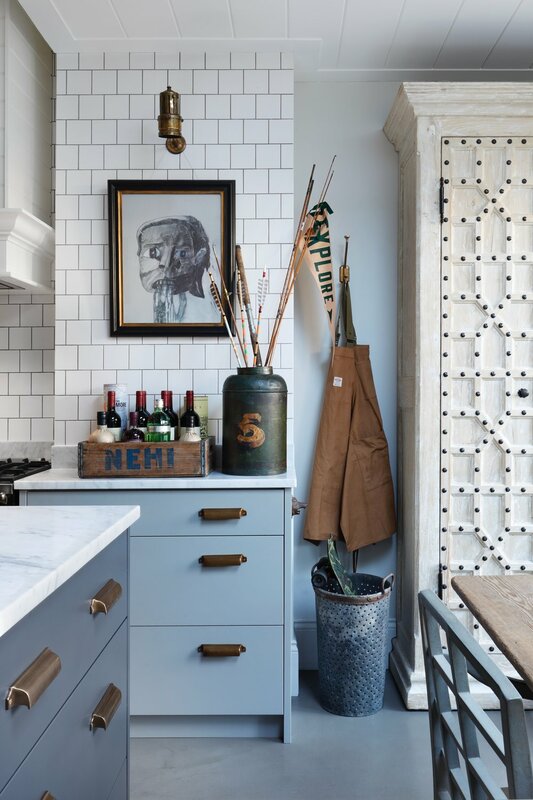 Another way to make a statement with the kitchen door handles is to use over-sized ones. The designer below has introduced long handles to take up most of the space of the kitchen door itself. It’s important that you replicate this through the kitchen for doors and drawers, as below, to bring continuity to the design. 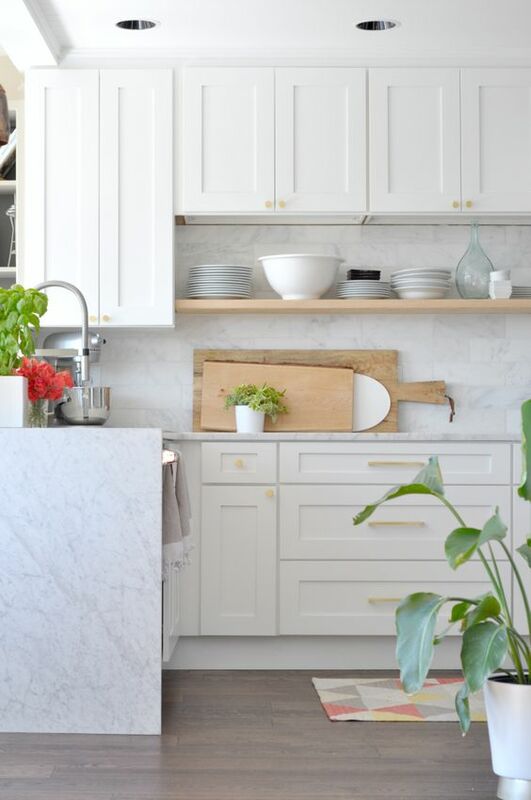 In a simple white kitchen, this can be a very effective way to bring in another design element. 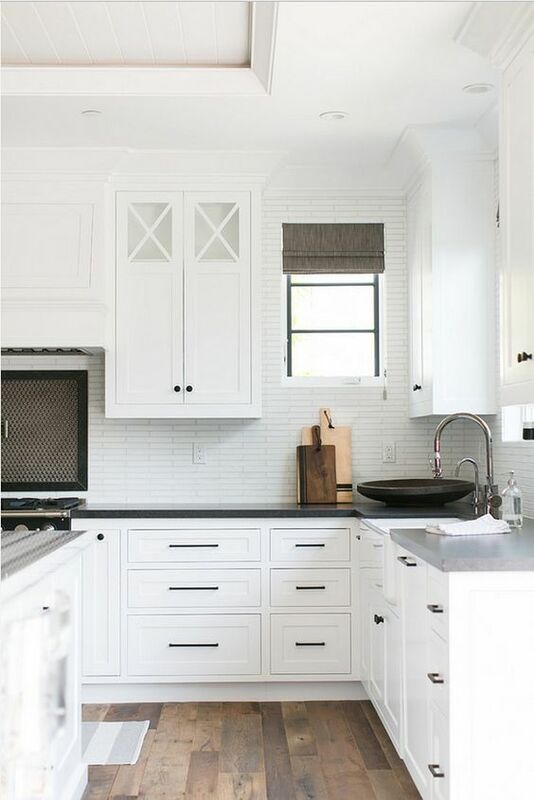 If you are making a colour statement, as in the black handles on the white kitchen below, you need to ensure that you don’t overdo it with the size too. Statement door handles in colour AND size can be overwhelming. The design below works well because knobs have been utilised on the kitchen doors while a pull handle has been used for the drawers. The pull handles on the drawers are also in proportion to the size of each drawer. There are certain kitchen door handles that also belong to a particular style of decorating so ensure that you take this into account too. 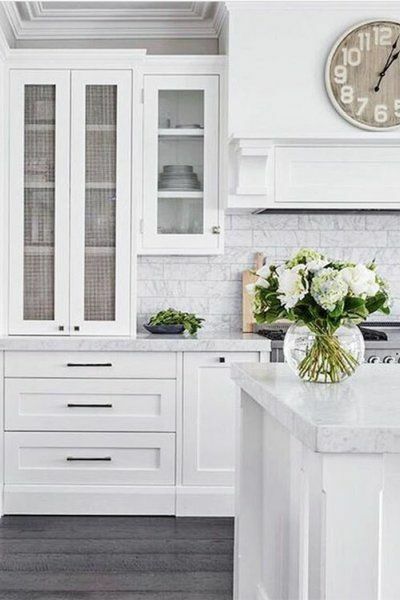 Shaker style cupboard doors can be partnered with a more streamlined simple nickel door handle or with a classic Shaker door handle to give you a more authentic look. This is demonstrated in the two images below. You can see that the more traditional door handle gives you a more authentic look while the first kitchen is definitely of a similar style but the handles give it a more contemporary edge. 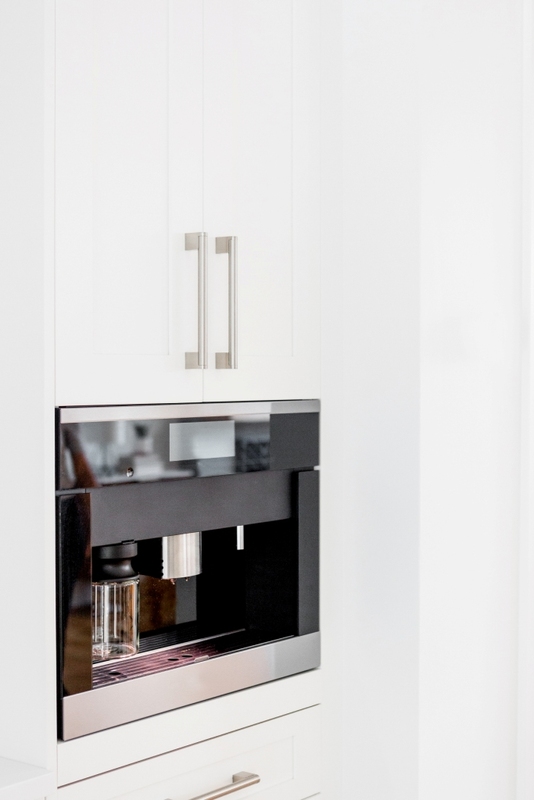 Don’t forget that if you have feature appliances, perhaps a bank of ovens and/or coffee machines that become a focal point that you will need to consider how your selection of door handles works with those. Consider the colour for your kitchen door handles Do you want them to blend into your kitchen joinery or to make a statement? 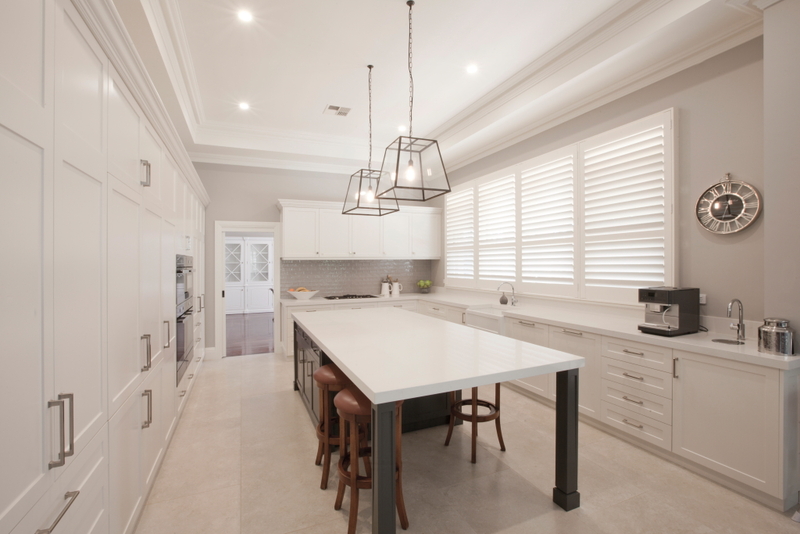 Whether the statement is subtle or dramatic, ensure that the colour links to other elements of the kitchen design, eg benchtops, shelving and styling. Think about the size of your kitchen door handles Do you want them large enough to make a statement in their own right or keep them smaller and in proportion to each drawer or door size. Remember that you don’t have to keep all of the kitchen door handles the same. You can mix knobs with pull handles. 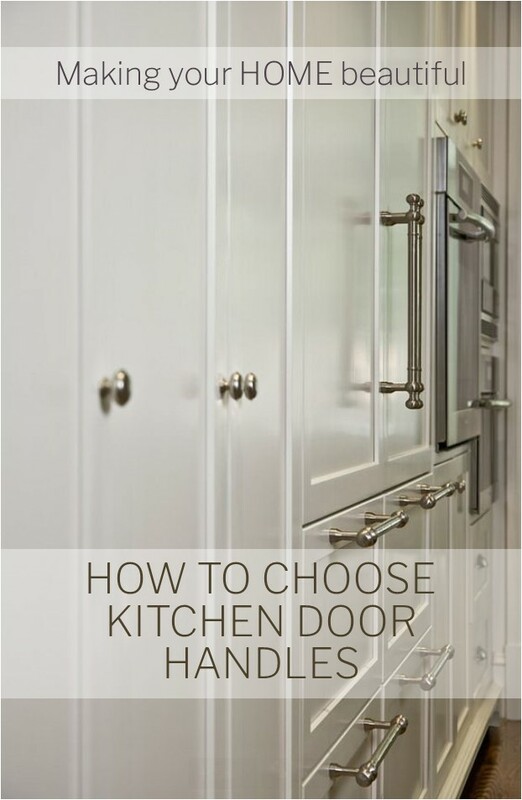 You also don’t need to have kitchen door handles on all of your cabinetry. Upper cabinetry can have no handles at all and be opened by a push mechanism or from underneath by making the door longer than the cabinet (my favoured option). This look is streamlined and you just have handles on lower drawers and doors. Consider the material that the kitchen door handles are fabricated from. If you are in a coastal location you will need to invest in very good quality hardware as a cheaper alternative may corrode very quickly. Try before you buy Don’t just purchase kitchen door handles from the internet unless you have previously seen and most importantly, felt the product. You need to be able to comfortably grip the handle and ensure that it doesn’t have sharp edges that can be quite uncomfortable. Perhaps buy one handle and/or knob online before committing to the entire range. Final note Ensure that you consider the style of kitchen and the style of your house and decorating when selecting a handle. I would love to hear how you have selected your door handles and whether you think it really makes your kitchen. And of course, if you have any questions, I would love to hear from you. Related: Have you considered using blue for your kitchen cabinetry?